ICI Industrial Capability Index Figure 3.27. The Mach 8 combined cycle launcher is also limited. Figure 3.28. 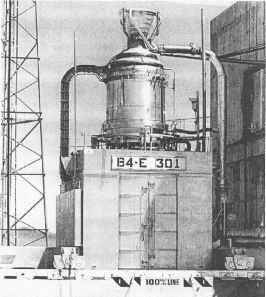 The Mach 12 combined cycle launcher is also limited. dilemmas of hypersonic vehicle design is illustrated in Figure 3.27. Using reasoning based on subsonic aircraft, a smaller aircraft should be easier to fabricate and operate than a larger one. However, for a SSTO demonstrator, that is, a demonstrator that can actually achieve orbital speed and altitude, the opposite is the case. 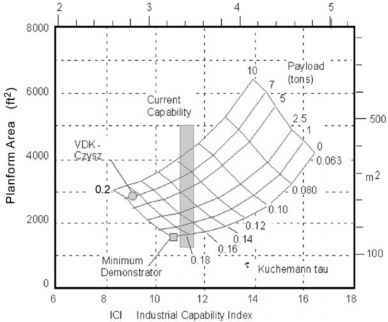 The minimum sized, zero payload demonstrator is on the ICI boundary, and at the maximum value of tau. A operational vehicle with a 7.0-ton payload, as analyzed by Vanderckhove and Czysz, has a significant reduction of the ICI value needed. 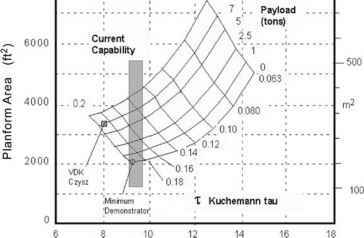 As the payload increases, the tau value at the ICI boundary decreases, so that for a 10-ton payload the minimum value of tau is 0.14. Please note it would be possible to build a hypersonic demonstrator that could achieve Mach 12 for, say, just 5 minutes flight time, but the mass ratio for that mission might be on the order of 1.8, far from the 8.1 ratio required to reach orbital speed and altitude.